← The end of the line? I thought this Account of the struldbrugs might be some Entertainment to the Reader, because it seems to be a little out of the common Way; at least I do not remember to have met the like in any Book of Travels that hath come to my Hands; and if I am deceived, my Excuse must be, that it is necessary for Travellers who describe the same Country, very often to agree in dwelling on the same Particulars, without deserving the Censure of having borrowed or transcribed from those who wrote before them. Gulliver’s Travels Part III: A Voyage to Laputa, Balnibarbi, Luggnagg, Glubbdubdrib, and Japan Incredulity usually greets me when I blurt out the three nouns and an adjective, seemingly randomly strung together, of Kashiwazaki Turkish Culture Village; that incredulity is squared if my interlocutor knows where the city of Kashiwazaki is—in deepest, darkest Niigata—and for what it is these days most famous—being home to (most of) the world’s largest nuclear power plant, Kashiwazaki-Kariwa, so vast it sprawls into the neighboring village of Kariwa (hence the double-barreled appellation)—to which we’ll refer as K-K, as experience suggests that even foreigners with a modicum of proficiency in Japanese have trouble with its pronunciation and psychology suggests that people are prone to prejudice against words and names they can’t pronounce—and we wouldn’t want that. Kashiwazaki Turkish Culture Village was a demented brainchild—perhaps the most demented brainchild, although the competition is brutal—of a man fiercely philoprogenitive of demented brainchildren, Ryutaro Omori (1928-2004), the boss of Niigata Chuo Bank, a second-tier regional bank that had only graduated from mutual savings & loan to orthodox bank status in 1989, a man so tone-deaf to the clanging cymbals of the economic orchestra that he failed to hear that the Bubble had burst and, brimful with all the champagne optimism of which our species is so effortlessly capable, decided in the early 1990s to finance not one, but three theme parks, inspired by his Golden Ring concept, in which he pictured a great golden ring laid across the map of central Honshu and in which the theme parks, running in an arc from Niigata in the northwest to Mount Fuji in the southeast, would sparkle like diamonds on a ring. First to come and last to go was Niigata Russia Village (opened 1993, closed 2003). Last to come and first to go was Gulliver’s Kingdom (opened 1997, closed 2001), on the flanks of Mount Fuji in the now dismembered village of Kamikuishiki, amid the curséd sites of the dismantled headquarters of the murderous Aum Shinrikyo terror cult, which can’t have helped with the public relations—indeed, urban legend has it that the park’s giant concrete Gulliver lay pinned atop the foundations of the Satyam No. 7 sarin gas plant. In between, Kashiwazaki Turkish Culture Village opened in July 1996 at an initial cost of Y4.5bn (about $60mn), replete with a grand bazaar cram-full of gaudy, Orientalist knick-knackery from nazar boncuğu evil-eye amulets to floral ceramic serving plates to disposable cigarette lighters adorned with transfers of trad-clad Turkic damsels, a Trojan horse of mountainous size, more ark than horse, with a spiral staircase between its legs, a Noah’s Ark, more round-prowed fishing boat than ark, which housed a menagerie of odd-eyed Van cats, a mosque, purportedly a (more) secularized and much scaled-down interpretation of the Hagia Sophia, with minarets but no mihrab or minbar, and a multi-storey car park for the visitors who never thronged. For entertainment, there were restaurants showcasing one of the world’s “three great cuisines” (the other two being Chinese and French—whence does that odd meme originate?) and belly dancing, of course, but also—at least on occasion—yağlı güreş grease wrestling, in which strapping men clad only in black kisbet lederhosen douse themselves in olive oil and grapple on the ground, with their hands often inside their opponent’s trunks grasping for fingerholds on the crotch, a spectacle that caused bewilderment in the Japanese audience, according to one Turkish aficionado of the sport. By 1998, just a couple of years after the park had opened its doors and as the stormy seas of financial crisis swamped Asia and led the Nihon Maru to list gently into recession, visitor numbers were falling away precipitously, which caused the park management, their optimism undimmed by experience, to draw the entirely erroneous conclusion that what the good folk of Kashiwazaki wanted was more Turkish culture, not less, and specifically more Turkish Culture Village, not less, so they doubled down and dipped into the ever capacious and welcoming pockets of the Nippon Credit Bank, pockets that were to bring down the bank in the December of that year, and borrowed another Y3bn (about $40mn) to build a 40,000m2 extension to the initial 49,000m2 lot, which opened (with entrance fees hiked) in July 1999, a month after the Financial Services Agency, concerned about the mounting non-performing loans of Niigata Chuo Bank, had slapped it with a prompt corrective action order. Shady English language school operator Nova, which itself was to go belly-up in scandalous circumstances in 2007, was seen as a prime candidate for to sign up for a private placement of bank shares to boost depleted capital, but eventually it balked and by September 1999, a good old-fashioned 19th century bank run, this one on the brink of the 21st century, had started at Niigata Chuo, driving the bank under in the December of that year, although it was not finally wound up until 2006. By then Ryutaro Omori was two years dead and buried; I’d like to think—with no malice aforethought—that he died a broken man but I bet he didn’t. In all the galaxies of the Internet universe, I can only track down one photograph of him, dating from 1996 when he was 68, every inch the rotund provincial bank manager, head cocked back and eyebrows at once quizzical and comical, as if aware of the great jest their owner was playing on the world, a photograph accompanied by an interview in which Omori lays out his plans to build an international airport five kilometers off the Niigata coast (would that have been for the Pyongyang tourist trade, one wonders) and the interviewer speculates that Omori might just stay on at the helm of Niigata Chuo until he turned a centenarian. In May 2001, the state-mandated vultures of the Resolution and Collection Corporation (RCC), an entity entrusted with the Herculean task of cleaning up the Augean stables of banks’ Bubble bad dung-debts, started swirling around the mostly reeking assets of Nippon Credit Bank, and Kashiwazaki Turkish Culture Village closed its doors in the December of that year. But this was not the end of the village, for the jewel in Kashiwazaki’s admittedly modest tourism crown could not be allowed to die a martyr to mere debt, and in July 2002, the city bought the property from the RCC for what must have seemed at the time like the knock-down bargain price of Y150mn (about $2mn) and leased the park to a consortium of local touristic firms for an annual peppercorn rent of Y4mn (about $50,000)—at which rate it would have taken the city just shy of four decades to directly recoup its investment—and the Kashiwazaki Turkish Culture Village reopened the same month, with entrance now free. On staggered the park for another couple of years, until nature intervened, as is so often its wont, in the shape of the now almost forgotten Chuetsu Earthquake of October 2004, the first of many earthquakes we’ll encounter before this tale is told, which although a mere Richter 6.8M (how we scoff at those these days), still contrived to kill forty or so folk, was the deadliest in Japan since Kobe in 1995, and also inadvertently snuffed out the life of the Kashiwazaki Turkish Culture Village, which closed for good a month later and was liquidated with cumulative losses of Y150mn, the same amount for which the city had bought it just a couple of years before. If this was where the curtains fell on the short but sorry saga of the Turkish Culture Village, then it would be just another fable of failure, but it was in its death, not life, that the real fun and games began, for this had been, after all, the world’s first theme park with a Turkish twist, and the eyes of the people of Turkey—or at least, the Turkish embassy in Japan—were on developments, not least because the Turks had donated some of the park’s attractions, including a replica of the tomb of Alexander the Great and, crucially, a four meter high, four tonne bronze statue of one Mustafa Kemal Ataturk, the widely revered founder of the modern Turkish state, on horseback, especially commissioned by the Turkish Ministry of Culture and Tourism from sculptor Metin Yurdanur in civvies, rather than the usual military garb, so as not to offend the delicately and newly found antimilitarist sensibilities of the statue’s hosts. Murmurs of concern over the future of the park were heard to emanate from the Turkish embassy and proposals, which come to naught, were floated for the Turkish Chamber of Commerce in Japan to take it over. Meanwhile, the Kashiwazaki City authorities put the cadaver of the theme park out to competitive tender, and three firms bid for it by the March 2006 deadline. In a plot development few could have foreseen, the issue of the park’s future was then hijacked by the (inter)nationalist right, in the shape of the BS (broadcast satellite) station Channel Sakura, of which your terrestrial-television bound correspondent had confessedly never heard, and which reputedly evades legislation on the political neutrality of broadcasters by dispensing with editorial content and having all opinions voiced by (mostly minor) politicians, pundits, and other upstanding members of the commentariat. A special program on the fate of the Turkish Culture Village and the insults supposedly being heaped on the Japanophilic nation of Turkey by Kashiwazaki mayor Hiroshi Aida featured the Turkish flag (and Channel Sakura is very keen on flags) hung upside-down throughout. Demonstrations were planned, a committee was formed, and in May 2006, this committee, the cumbersomely named Committee of Regional Assembly Members who Support Friendly Relations between Japan and Turkey, barged into the Turkish Embassy in a failed bid to persuade the ambassador to intervene and stop the sale. In June 2006, the hammer finally went down on Kashiwazaki Turkish Culture Village, sold for Y140mn with the approval of all Kashiwazaki municipal assembly members present to a local industrial waste recycler, Wastec Energy, which had quixotically branched out into the business of marriage and opened a wedding resort adjacent to the village, into which it planned to—and indeed did—expand. The contract of sale contained an explicit provision that Wastec be properly heedful of friendly Turkish-Japanese relations and that it fully consult with the city on matters concerning the statue of Ataturk. Nature, however, was not a signatory to the contract, and struck again, this time in July 2007 with the Chuetsu Offshore Earthquake, a 6.6M shallow crustal quake on a previously unknown fault just off the coast of Kashiwazaki that left a toll of 11 dead and some 1,100 injured, and which caused the statue of Ataturk to tilt perilously on its plinth. Wastec, fearful that the statue would fall, hauled it down off the plinth and abandoned it, splendid steed and distinguished mount on their undignified sides, in a grassy tract of wasteland and covered with blue tarpaulin sheets. The right took up cudgels again, this time with clubber-in-chief the Sankei Shimbun newspaper, ranting about indignities unbecoming to (the statue of) the hero of a friendly nation and asserting that criticism of the discourtesy from intercultural friendly associations and Kashiwazaki citizens was mounting. Wastec president Naoyoshi Hida disclaimed responsibility, saying, “To be honest, people going on and on about Turkey is a pain. I want the city to move the statue”. Mayor Aida likewise disclaimed responsibility, saying, “The statue’s not the city’s property and the city won’t restore it or buy it.” Wastec and the city ended up embroiled in lawsuits and the statue was left to molder in the grass, to the consternation of the Turkish Embassy, for a couple of years, as Wastec’s callous treatment of Ataturk’s statue threatened to become an international incident. At this point, the shadowy but mightily powerful Nippon Foundation, long a plaything of the late Ryoichi Sasakawa, the self but dubiously proclaimed “world’s richest fascist” and a man whom we’ve met before on these pages, interceded, and after many rounds of negotiations with all parties and a small town, Kushimoto, in the far-flung prefecture of Wakayama, off the coast of which a frigate of the Ottoman Empire, Ertuğrul, on the empire’s first goodwill voyage to Japan, foundered and sank in a typhoon in 1890, the statue of Ataturk was finally transported in May 2010 to Kushimoto and placed in the plaza in front of the lighthouse, a spot chosen by the Turkish Embassy, to be formally unveiled on June 3, 2010, the 120th anniversary of the wreck of the Ertuğrul. Here endeth, then—for now—the lesson of the Kashiwazaki Turkish Culture Village. Death dealt very different hands to Omori’s Siamese triplets. 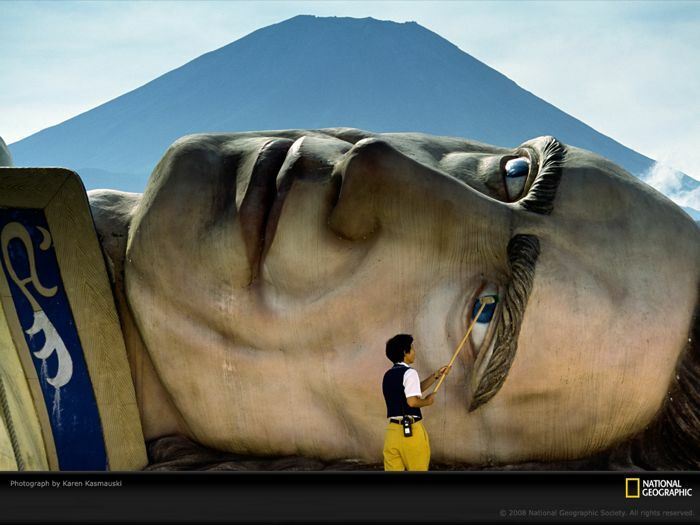 In life, Gulliver in his Kingdom looked like this: (thank you, photographer Karen Kasmauski and National Geographic). In 2002, the Kingdom was auctioned off at the third attempt to a resort operator and in 2004, a sliver of it reopened as an attraction called The Dog Run, whose unique selling point was that here, and only here, dog owners could let their pooches roam free on grass. It lasted a year. In 2006, the land was sold again, to a hugely ambitious Hiroshima-based real estate developer, Urban Corp., captained by another dreamer and schemer, Hiroyuki Bozono, which was felled in August 2008 with debts of $2.5bn, the biggest bankruptcy in Japan in six coddled years, brought down by leverage-fuelled overhasty expansion, a whiff of links to organized crime, and most proximately and perhaps most disastrously, a complex $300mn convertible bond and swap deal with French bank BNP Paribas, closed as the hyenas and jackals started to prowl, a deal on which disclosure was not, shall we say, full, frank, and fair, one in which Urban Corp. thought it was borrowing Y30bn from French Peter to pay Japanese Paul but ended up with less than a third of that, as the deal was linked to the share price and BNP Paribas was furiously converting the bonds into shares and selling them, driving the shares lower in a panicky market on the precipice of the Lehman Brothers collapse. Banksters, eh? Just a few rotten apples, to be sure. For an unfathomable reason I’m reminded of an observation of psychologist Paul Rozin, an expert on the cultural evolution of disgust, that “a single cockroach will completely wreck the appeal of a bowl of cherries, but a cherry will do nothing at all for a bowl of cockroaches”. Meanwhile, in 2007 Gulliver and his Kingdom had been dismembered limb from giant limb to make way for the grand resort that Urban Corp. was planning. After Urban Corp. went tango uniform, the land was auctioned off yet again, unpropitiously just days after the Great East Japan Earthquake in March 2011, and there the trail, as doggedly as I can pursue it, runs cold. In death, Niigata Russia Village has enjoyed a more sedate and less chequered passing than Gulliver’s Kingdom, no doubt because of its undesirable real estate location in the sparsely inhabited hills behind Niigata City, where it has been left to rot and ruinify, the only events of note an arson attack in September 2009, which partly razed its hotel, and numerous small acts of vandalistic love, ably photochronicled here. But what remained of the physical relic-icons of the Kashiwazaki Turkish Culture Village? On this the massed resources of the Internet drew a blank. It was time, I felt, to investigate. I suppose you’ve been to the Turkish Village since. I found it pretty disappointing- really not much to look at. Though I was unlucky enough to turn up when some gardeners were doing maintenance on the grounds, so couldn’t even get a close-up on the ruined doric columns. Hopefully you’ll have been more fortunate. Lots of interesting history in this post. I wonder where you dig it all up. Not spectacular, maybe, as Gulliver must have been, but I enjoyed it. Google and Wikipedia. Search is my day job. I just posted part two–enjoy the colonnades! The horizon is always a little brighter when a new Spike hoves into view. Looking forward to Part 2! I lived in Kamikuishiki when the theme park and the Fuji Chuo golf course was being planned. I remember seeing drawings but I’m hazy on the chronology. I have a feeling that I saw the plans for Gulliver well before the Tokyo subway gas attack – and therefore before the police stormed into the Aum ajito, so I think the urban legend about Gulliver straddling the foundations of Satyam 7 must be just a haikyo explorer’s fantasy. I recall showing some dignitaries from the International Canoe Federation around Lake Motosu shortly after the whole thing blue up – weirdest day of interpreting in my life: “As you may have heard, a religious cult was found to be producing nerve gas just a few miles up the road from here. While we anticipate that this will not impact the smooth running of the World Junior Canoe Championships we are considering contingencies … blah blah”. That would be interesting if accurate; Wiki suggests that Gulliver was invited in to repair (!) the Aum-ruined reputation of the village. On that, I’m pretty sure you’re right. But I like it nonetheless. Lovely story about the International Canoe Federation–presumably the World Junior Canoe Championships went off without a hitch? Hmm. I was in Kamikuishiki from ’93 to ’96. The WJCC was that summer. (Yes – It went down without a hitch, apart from the misdemeanours that you expect when you bring together a big group of big teenagers). I can say with certainty that the Fuji Chuo golf club (with its greens and obstacles in childishly recognizable shapes) and hotel were completed before that summer. The hotel was used as an official hotel for the WJCC. After the subway gas attack, there was talk about the village needing investment to get over the bad reputation it had earned. (I’ve got some stickers from an “I like Kamikuishiki” campaign somewhere – Let me know if you want a set). But I am almost certain that I saw pictures of the park with Gulliver in the Yakuba before the attack. I went to try out the bobsleigh some time in ’96, I think. If I recall correctly, the park wasn’t officially open but Gulliver was already in place. I went back to the park in April ’98 and took a ride in a balloon (imported from France IIRC) that went up and down. The park was pretty empty. We were the only two people in the gondola of the balloon (capacity 20 or so). It was clear that the park couldn’t sustain the concessions that had been built — Shops selling things like Gravad lax from Sweden. Oh blow! Blew not blue. I am awestruck. Thank you. The image that you are crediting to Michael John Grist is actually mine, and I’d appreciate attribution and a hyperlink to my web site be put with it. The hyperlink itself could be to the root of the site (http://oldcreeper.com), or directly to the Gulliver gallery (http://oldcreeper.com/gullivers-kingdom). Sorry, at this moment in time I don’t care enough to cater to your demands.